PLEASE NOTE: VENUE, CONCERT & TICKET PRICE HAS CHANGED . Due to unforeseen circumstances this concert will no longer be held in Vivary Park but held at Creative Innovation Centre CIC (CICCIC) near Vivary Park and will feature The Deane Big Band only. Hence the ticket price has been lowered considerably (from £10) and we are still raising funds for charity Taunton Association for the Homeless. Sunday 7th August. Doors Open 6.30pm. Performance starts 7.30pm. Finish 11pm. Tickets from £10. Raising funds for Taunton Association for the Homelesss and CICCIC community projects. Enjoy an amazing night of big band music in the heart of Taunton town centre and help raise funds for good causes while having an amazing night of entertainment. This charity and ‘Taunton Flower Show Appreciation Concert’ will wow you with music throughout the last century so you’ll experience the traditional big band sounds of Glen Miller, Count Basie, Benny Goodman, Duke Ellington and Ted Heath; to the mid-late 20th century sounds of Frank Sinatra, Michael Buble and a few pop stars to name a few. All provided by Deane Big Band. A truly magical night of big band music. Moreover, due to the amazing acoustic nature of CICCIC’s memorial hall this concert will up close and personal. Seating is provided but not reserved and their will be a licensed bar and a raffle to help raise funds. 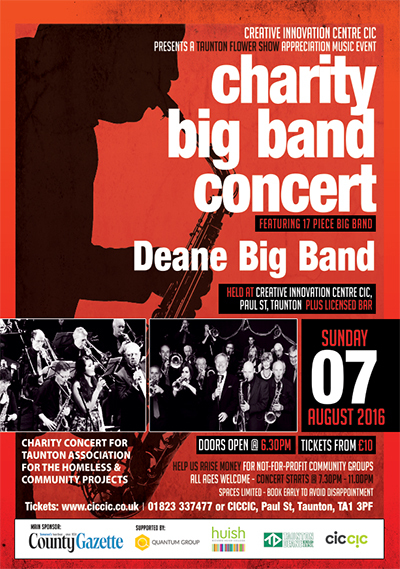 The Deane Big Band is one of the top big bands in the South West and shear joy to watch and hear. The band plays music from the classic big band era of the 1930’s and 1940’s and with two great vocalists you’ll simply love the soft melodies and big brass sounds. You’ll be foot tapping as soon as they play and you even get the urge to dance. Due to the size of our band spaces are even less than normal so if you want to be the first to experience this amazing night you should book as early as possible. Spaces are also limited. CICCIC is located at the top of Paul Street, Taunton at the top of the small hill next to traffic lights. Disabled access and toilets are available.